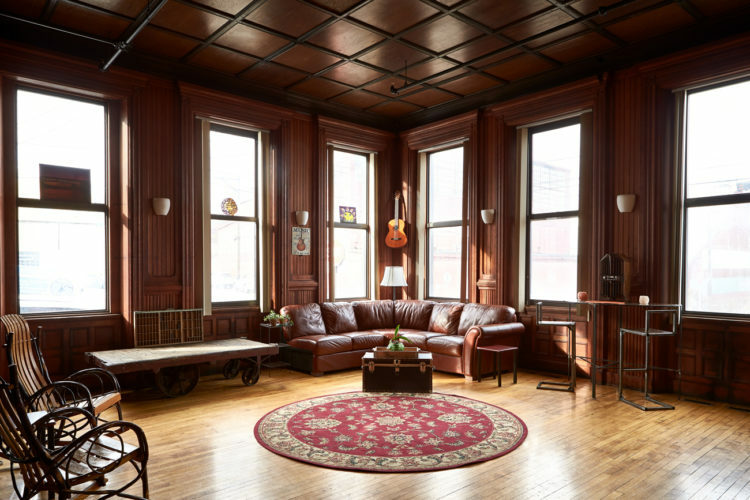 Pittsburgh has a hostel again, and it’s not what you might expect. 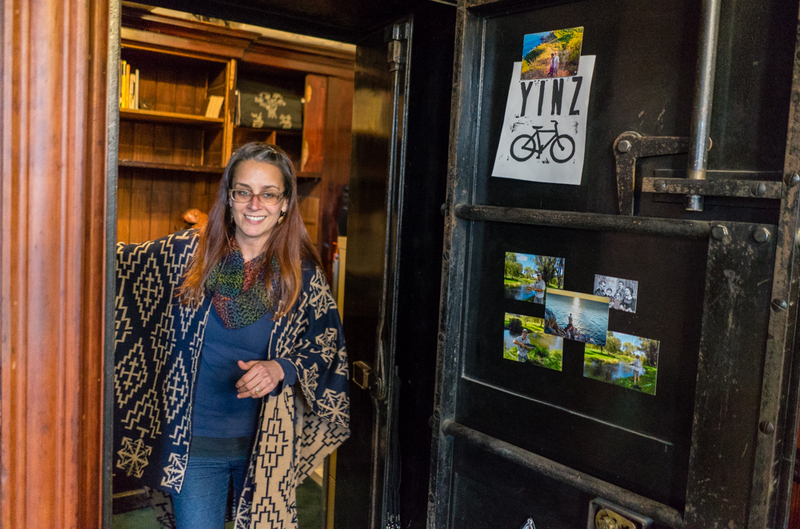 After more than four years of sweat and labor, Mary Beth Karabinos and Paul Kletter have transformed a squat, 135-year-old office space into a quaint and cozy lodge for cyclists setting off on the Great Allegheny Passage. Pittsburgh has been without a hostel since the Pittsburgh International Hostel at the corner of Arlington and E. Warrington in Allentown closed its doors in 2003. Communal Great Room at South Side Traveler’s Rest. Courtesy SSTR. In public remarks at a small open house March 23, Mayor Bill Peduto expressed optimism that Traveler’s Rest, located at the corner of S. 6th and Bingham in the South Side, would attract not only regional trail-goers but also international travelers and backpackers. The building itself, originally constructed as the headquarters for the A.M. Byers Wrought Iron Pipe Co., retains much of its earlier elegance. Original flourishes remain throughout. Visitors arrive at a high-ceilinged, light-filled great room complete with overstuffed leather couches, cozy kitchenette, and of course, free wi-fi. There’s even an original bank vault, which Karabinos says was robbed in 1946. The 5,000-square-foot Traveler’s Rest has eight rooms, only three of which are shared or dorm-style. For $40, you get you a spot in a bunk bed, while private rooms start at $75. Downstairs, the wood-paneled Byers Suite with a private bedroom, bathroom and living room runs about $180. All the bathrooms are private and newly remodeled. Mary Beth Karabinos shows an original vault inside South Side Traveler’s Rest. Photo by Brian Conway. South Side Traveler’s Rest was helped along by a loan from the Progress Fund, which has a history of encouraging economic development alongside regional bike trails. For cyclists, Traveler’s Rest also boasts secure parking, communal bike tools and an on-site mechanic who can help travelers tune up their rides before setting off on the trail. Currently, Kletter says, most GAP cyclists typically stay somewhere in Homestead’s Waterfront shopping district before biking to the Point to start (or end) their journey. He is hopeful that their central location and affordable cost will encourage those same groups to spend more time in Pittsburgh on their journey. South Side Traveler’s Rest is located at 67 S. 6th Street in the South Side. The post South Side Traveler’s Rest gives Pittsburgh a hostel built for bicyclists appeared first on NEXTpittsburgh.